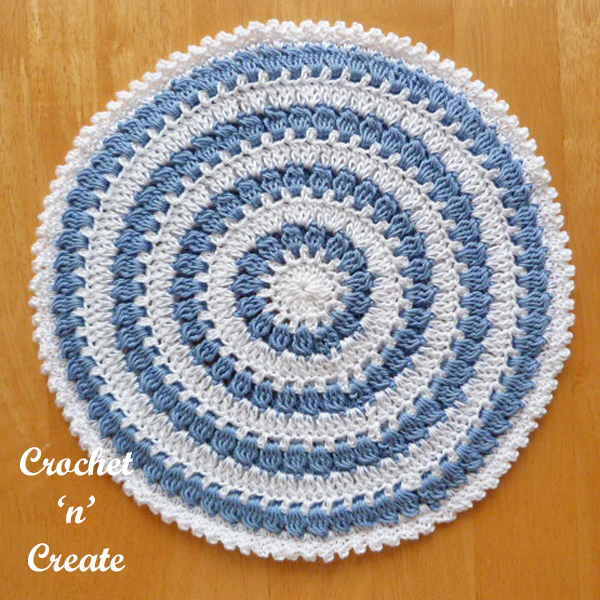 My free Crochet hot pad, have you had the family around over the holidays and found that you didn’t have enough mats on the table for those hot dishes, I did, so I designed this one in 100% cotton with double thickness. 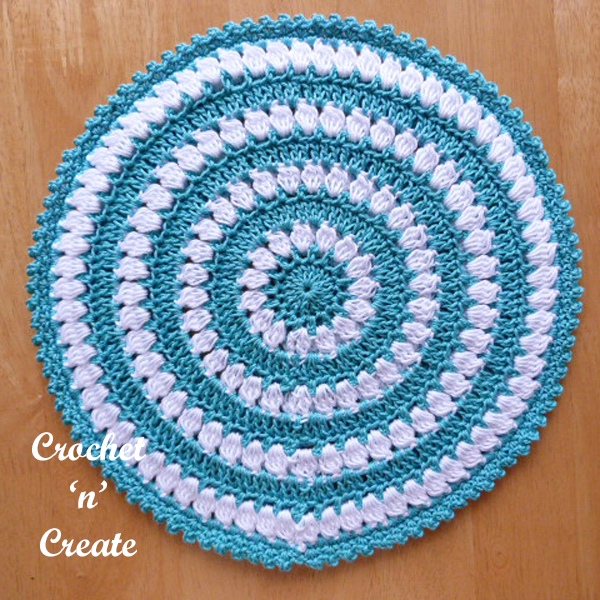 Make them in various colors or have a theme for birthdays, Easter and so on. Whatever you use them for I hope you enjoy crocheting them. 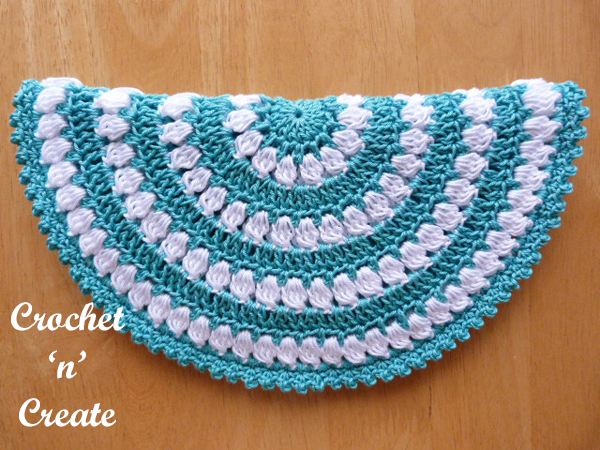 free crochet hot pad pattern on your Facebook and Pinterest. dc2tog. Leaving last loop of each dc on hook work 2dc in next stitch, yo and pull through all loops. dc3tog. Leaving last loop of each dc on hook work 3dc in next stitch, yo and pull through all loops. dc4tog. Leaving last loop of each dc on hook work 4dc in next stitch, yo and pull through all loops. 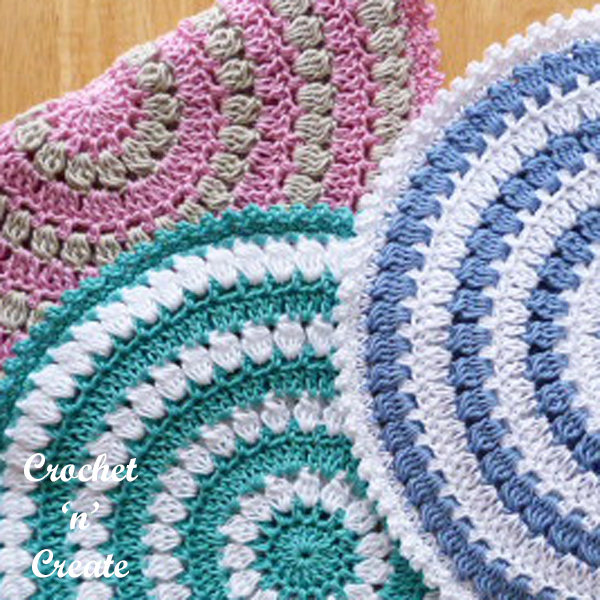 Make 2 Pieces the Same – Using color 1 make magic circle, ch3, 14dc in circle, pull loose thread to close, sl st to the top of ch3 on the beginning of row. Turn. Weave in and trim off loose ends. Next Row – ch1, (1sc, ch2,1sc) in base of ch1, * skip 1sc, (1sc, ch2,1sc) in next sc, * rpt from * to * to last sc, skip sc, sl st to first sc. Fasten off. Finishing – Weave remainder of loose ends and trim. If you wish to print only the text of the crochet hot pad, select the content you want to print, click file (top left corner on browser), then print, this should take you to your printer settings, choose selection and then OK. 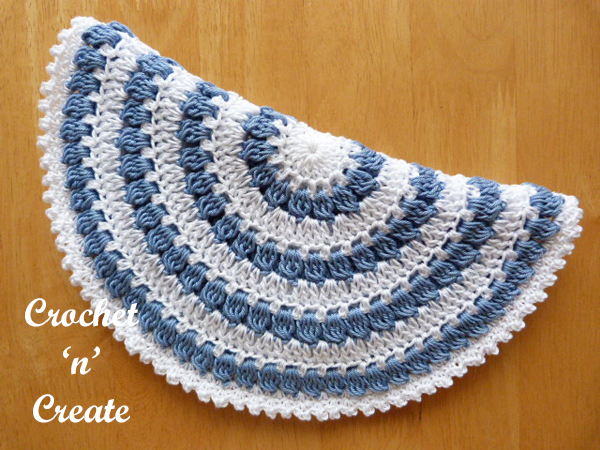 The written instruction and pictures for this pattern are copyrighted to crochet ‘n’ create © 2016. 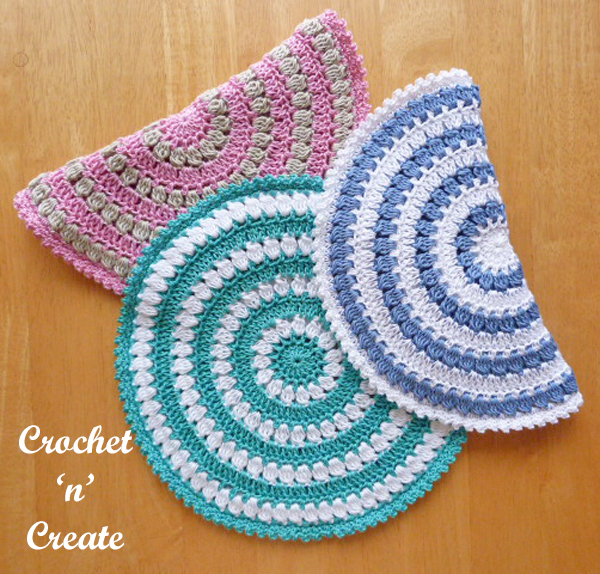 You are welcome to sell the finished products made from this free crochet hot pad pattern, I just ask that you please put a link back to crochet ‘n’ create. 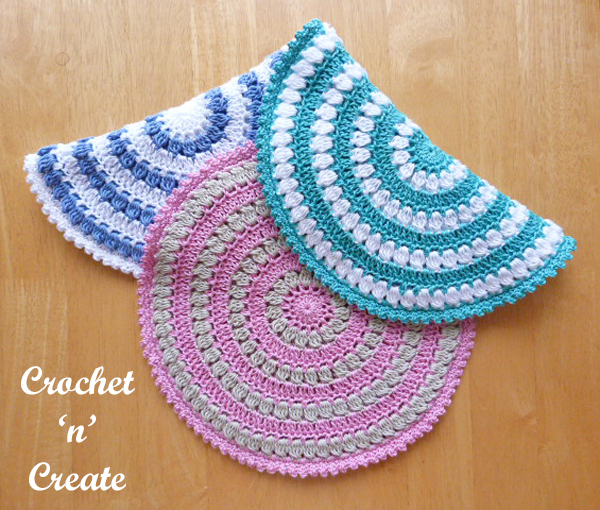 If you wish to share this pattern on social media only use a direct link to the pattern page on crochet ‘n’ create. 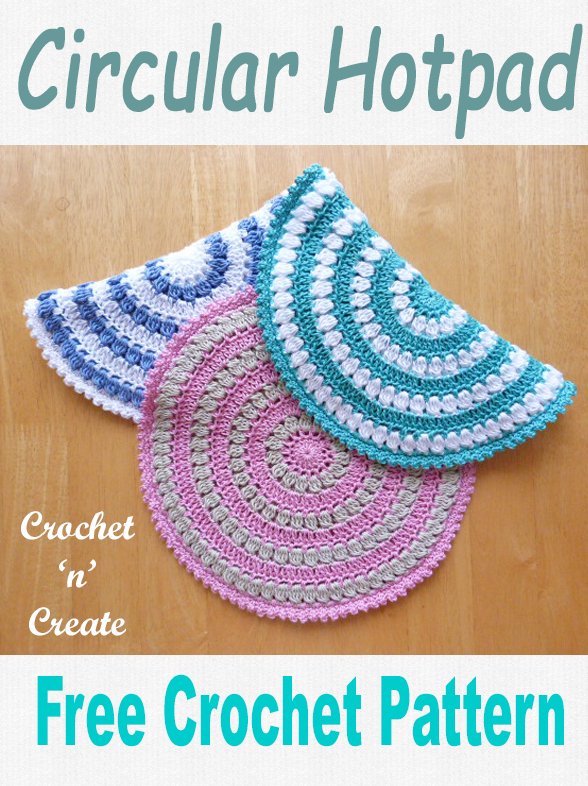 This entry was posted in crochet for the kitchen, Crochet Hot Pads, free crochet patterns, Home and tagged crochet, crochet for home, crochet hot pad, crochet mat, free crochet patterns on 24th January 2017 by crochetncreate.